.. per capita personal income (PCPI) is the most comprehensive measure of individual economic well-being. 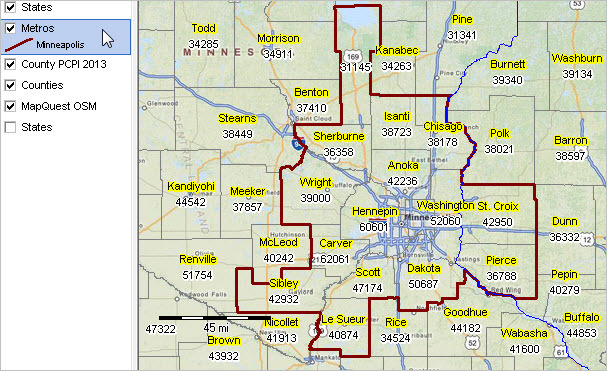 The PCPI has been updated with new estimates for all counties and metros. Among all metros for which the PCPI was estimated, the Atlanta metro was ranked number 154 in 2008 and 269 in 2013. The PCPI changed from $39,889 in 2008 to $41,307 in 2013, a change of $1,418 (3.55%). How might changing economic conditions impact you? How can you use personal income estimates and related measures to assess the impact of regional economic change? This section reviews how you can access and use these data for any county or metro. See the Web version of this section with interactive table. Update: The Regional Economic Information System (REIS) updates on November 19, 2015 with new estimates for 2014, extending the time series. The following map shows the Atlanta metro (view profile) with bold brown boundary. 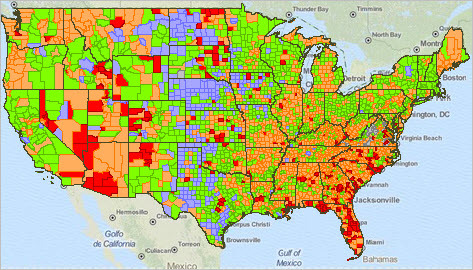 Counties are labeled with county name and 2013 per capita personal income. PCPI estimates, available as an annual time series 1969 through 2013, are developed as a part of the Regional Economic Information System (REIS). A distinguishing characteristic of the REIS data is that they are a set of multi-sourced data organized and used to estimate personal income. Personal income, unlike money income, is income received by all persons from all sources. See additional information about these data. A second characteristic is, unlike the American Community Survey (ACS), the REIS are not based mainly on a sample survey but rather employer reported data. Third, the lengthy annual time series lends itself to use in modeling and trend analysis based on a set of consistently defined subject matter. 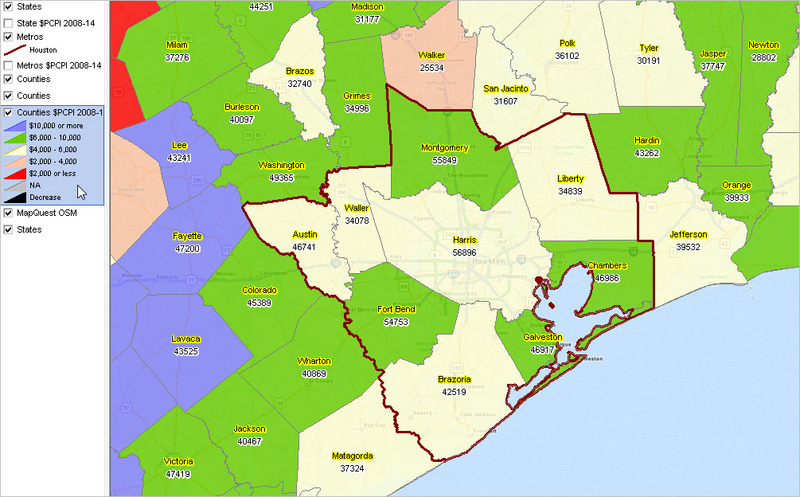 The following graphic shows counties with the largest 2013 PCPI. 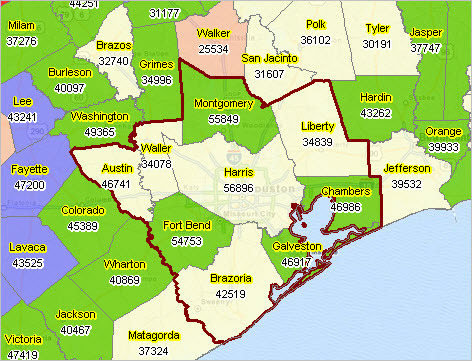 Use the interactive table to rank counties on other measures or rank within a state. Use this interactive table to select a metro and view the metro profile. The following graphic illustrates clicking the link shown in column 2 to display the metro profile for the Dallas metro. Equivalently, click this link to view the Dallas metro profile. Join me in a Data Analytics Lab session where we review accessing, integrating and using the REIS data with other data. There is no fee. Discuss how tools and methods reviewed in this section can be applied to your situation.